From 23 to 30 April 2019, website and smartphone users can enjoy discounted tickets in Cotai Water Jet Special Discount Zone for 23 April – 13 May 2019 sailings (“Campaign”). 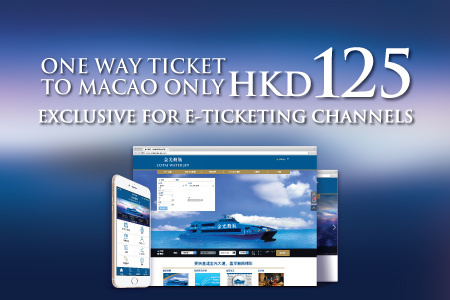 Cotai Class discounted one-way ticket will be available at HKD 120 (including tax). Passengers purchasing the Cotai Water Jet one way ticket via Cotai Water Jet official website and IOS/ Android mobile application Special Discount Zone section are eligible for the Campaign (“Eligible Passengers”). City route refers to Hong Kong Macau Ferry Terminal to/from Macau Taipa Ferry Terminal. Each Eligible Passenger may purchase a minimum of one(1) ticket each time. Eligible Passengers can purchase discounted one-way ticket at HKD120 for designated sailings during the Campaign Period. This Campaign is subject to seat availability, with limited quantity, and on a first come first serve basis. Special Discount Zone tickets are only applicable to designated sailing date and time. All tickets purchased under this Campaign must be used on or before 13 May 2019. For city route, Eligible Passengers shall present QR code at the gate no less than 10 minutes before departure; or Eligible Passengers shall redeem tickets by presenting the transaction number, the booking credit card and identification document at designated ticket counters no less than 30 minutes before departure. The offer under this Campaign cannot be used in conjunction with other offers. The discounted ferry ticket cannot be upgraded to VIP cabin. Cotai Ferry Company Limited (hereinafter, the “Company”) will not be responsible for any lost or stolen ticket, and no reissuance of ferry ticket will be entertained. The Company reserves the right to pause, change or terminate this event and other terms and conditions without notice. In case of any dispute arising out of or in connection with this Campaign, the Company reserves the right of final decision. The English version of these Terms & Conditions shall prevail in case of discrepancy between the English and Chinese versions.